After a lot of thought, I’ve decided that a number goal is not going to work for me this year. Unfortunately, number goals are the easiest to measure, so keeping track and keeping on track may be harder. What I need from my art this year is more complex and not as easily measured. That’s not to say that I don’t have fairly clear idea of where I’m heading this year, but the direction is based on my mission statement, not on cold numbers. . Although these things are always on my mind, this year’s challenge will revolve around these components. Make Art – This year, my emphasis will be on exploration and experimentation with the intent to develop new work. Instead of counting how many pieces are going out into the marketplace, I will be thinking about the direction of the artwork as the body of work develops. Make friends – I’m going to put a bigger emphasis on connecting with friends, fans and other artists. Make a difference – In my own small way, I think I already make a difference in the world. 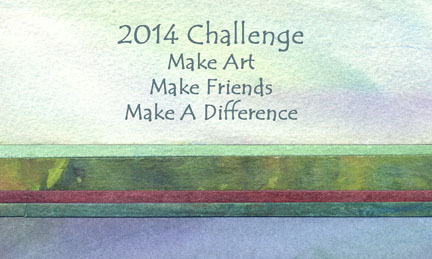 This year I want to explore ways that I can use my art to make a difference in the world. What are your overall goals and directions for the year? Anyone taking on a big challenge or project? Any advice or words of wisdom?? Those who know me personally know that I recently lost a very special person in my life. My mother-in-law, Jeanne Zook, died earlier this year. She was 96 and a fabulous woman, one of those truly inspiring people who make you rethink your life. After sharing stories and insights with lots of relatives and friends over the last months, I’ve come to the conclusion that I fall short when compared to her. (Same feeling I had after my own mother died.) Jeanne was incredibly outgoing. She truly cared about everyone she came into contact with. She was happy and she made a point of being happy AND helping others be happy. What a legacy she left! Everyone who knew her was touched by her. She didn’t just know people’s names, she knew their dreams, their families, who had new babies, new grandchildren. She also knew their hardships and worries. How do you live up to that kind of example ? I think we all want to make the world a better place, but somehow she did it with grace and ease. My mother was a very similar soul to my mother-in-law. It’s one of the reasons that they got along so well. They both truly cared about other people and both had smiles that would light up a room with their warmth. I don’t know what any of this has to do with my challenge and/or big goal for 2014, but I want it to somehow be a part of it. So part of this is to bring more joy and happiness and caring into my world. I don’t think I’ll ever acquire the unexcelled people skills that both of my “mothers” exhibited, but I can work to quietly make things better for myself and for others. There were a couple of unintended consequences of my 2013 challenge. The first was the emphasis on production. On the up side, I completed more paintings in one year than I ever have in the past!! On the down side, I was often looking to what new piece I could post on my blog and what number it was in the scheme of things. Without being conscious of it, I think this stifled experimentation and exploration, definitely not a good thing for this artist. I have a couple of projects that I plan to work on in 2014 that are still in the exploration and experimentation stage. Counting finished pieces is not going to help me get these pieces done. 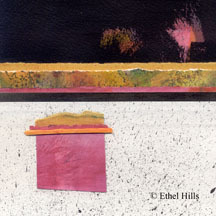 The other unintended consequence is that almost all of my 2013 paintings are small-scale – 8” square and smaller. I’m not sure why this is. It wasn’t done intentionally to create more pieces. It’s probably more reflective of a busier than normal family calendar. So my new challenge has to encourage experimentation and exploration, even if it means less production. And I need to allow myself to work on some larger pieces, even if they don’t succeed or take up too much time. Last year, I started my 80 painting challenge part way through the year. 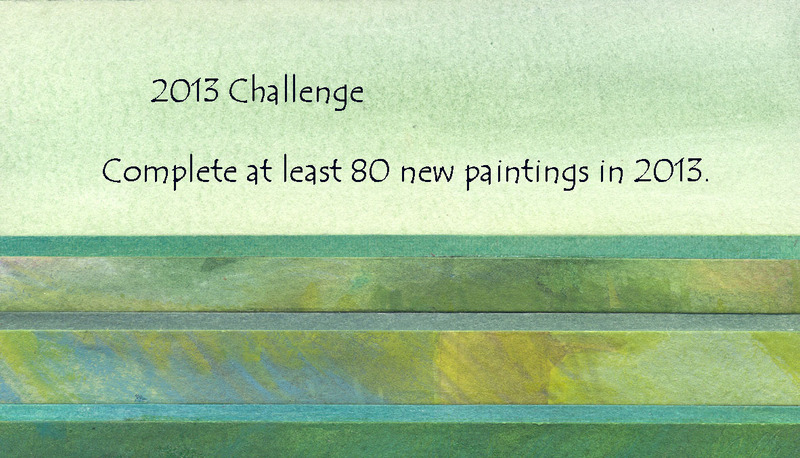 I decided that I would produce 80 paintings in 2013 and get them out into the world. That would be up from 65 in 2012. For the challenge, I counted paintings that are ready to go out in the world. That means they are in their final form, aesthetically “complete”. 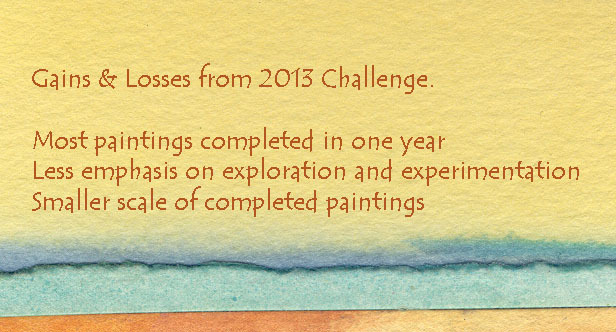 Based on this definition, I did complete exactly 80 paintings. I pulled back one of the last pieces and decided that it wasn’t done to my satisfaction. I thought I’d end up with 81, but didn’t quite make it. I’m considering what my challenge will be this year. Should it be the number of paintings completed, the number of paintings exhibited, the number of exhibitions, the number of square inches of painting surface, or the number of days I paint? Perhaps it should be about sales or about the amount of money that I can raise for charity. None of this feels quite right, so I’m still searching for the right idea. If anyone else is doing some sort of challenge or big goal for the year, I’d love to hear about it.